Over one hundred years ago, in 1899, in a small town named for a tavern, 23 people lit candles in the first communion service in the little mission Sabbath School that was to become First Presbyterian Church of Paoli. The town was only 18 years old then, having been “developed” in 1881 on 329 acres owned by the grandson of the original tavern owner. The major thoroughfare, the Conestoga Road (what is now Route 30 or Lancaster Pike) was a toll road, and the Columbia Railroad was barely 50 years old. Like the stagecoaches that had stopped at the tavern since 1769, steam engines now stopped in the town. They refueled with water pumped from a stream that still flows just off Spring Street, a few hundred yards from our church. Schofield’s general store – where you could buy anything, and where the Sabbath School had met for awhile – sat near the intersection of Lancaster Pike and what is now Rt. 252. And in this little town, some faithful people lit candles and built a church. 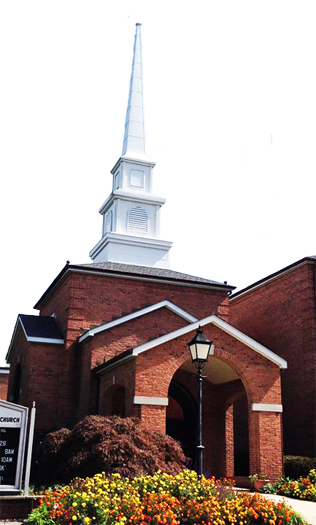 Over a century later, having constructed two new churches and two additions to those churches, the congregation has grown to over 1,650 members. Dozens of groups – from Bible Studies to circles, to the Men’s Breakfast and youth groups – meet weekly or monthly, and morning, noon, or night, the church building is rarely empty. Adult, youth, and children’s choirs, bell ringers, strings, brass, and woodwinds lift our hearts with music on Sundays. We support mission activities that reach all over the world to places such as Kenya, Egypt, the Middle East, Southwest Asia, Japan, and Eastern Europe, as well as mission work that stays close to home, such as the Food Closet and adult and youth work crews that have helped rebuild since Hurricane Sandy. That lighthouse is shining today because so many people in our past and in our present have tended the flame, and have been prepared to minister to those who responded to the beacon. We welcome you to become part of the story that, with God’s grace and guidance, has and will continue to become Paoli Presbyterian Church.